Mention master limited partnerships and sooner or later someone will bring up taxes. The big worry: A US version of Canada’s infamous Halloween Massacre of 2006, which shaved $24 billion off the value of income trusts in two weeks. At least for now, MLPs still appear very much in the clear. The combined market value of the 50 largest MLPs is still barely half ExxonMobil (NYSE: XOM). And even a very generous read of taxing them as corporations would yield less than $5 billion for the US Treasury. MLPs also continue to demonstrate their clout in Washington. Even House Ways and Means Committee Chairman Dave Camp (R-MI) has been reluctant to talk about new MLP taxes, though he’s currently proposing restrictions on real estate investment trusts (REITs). Of course, no one expected Canada’s Conservative Party to flip flop on the no trust tax promise it made voters less than a year before. And with few anticipating the MLP tax issue to re-emerge this year, even the hint a change is under consideration will trigger selling. Fortunately, there’s an easy way for MLP investors to protect themselves in advance from any real portfolio damage. The key is to take a lesson from Canada. When Canada’s tax was first announced, US investors fled the country en masse. But less than two years later, the S&P TSX Trust Composite was back at an all-time high. Meanwhile, close to a third of income trusts circa 2006 had been acquired, most at sizeable premiums. When the new taxes kicked in January 2011, all but a handful of trusts converted to corporations. Paying full freight was too much for many companies to bear. But that wasn’t the case for the well-run Canadian energy midstream companies. For example, Pembina Pipeline Corp (TSX: PPL, NYSE: PBA) converted to a corporation in 2010 without cutting its dividend. In fact, the owner of pipelines and other energy transportation and processing assets has raised its dividend every year since the Halloween 2006 tax announcement, both before and after conversion. And the stock’s 300 percent plus return since October 6, 2006, three weeks before the tax announcement, is actually better than that of Enterprise Products Partners (NYSE: EPD), the blue chip of the US midstream MLPs. Pembina has succeeded for three reasons: Recurring and reliable revenue, well-managed debt leverage and a core business where numerous tax advantages are available to corporations. Well-run US midstream companies like Enterprise share all three. You’d be hard pressed to find an MLP executive who’d argue for an end to the sector’s tax advantages. But it’s clear that if US MLPs are like Pembina, they’ll thrive long-term no matter what happens on the taxation front. The same applies to well-run energy producer MLPs. Canadian producer income trusts were hit hard by the drop in oil prices from $150 to barely $30 a barrel in late 2008, and even worse by the collapse in natural gas. When it came time to convert to corporations, however, only a handful of basket cases and poorly run outfits like Penn West Petroleum (TSX: PWT, NYSE: PWE) cut payouts deeply. Strong and well-managed fare, meanwhile, made the jump without. And Crescent Point Energy (TSX: CPG, NYSE: CPG) and Vermilion Energy (TSX: VET, NYSE: VET) also avoided cuts in 2008. 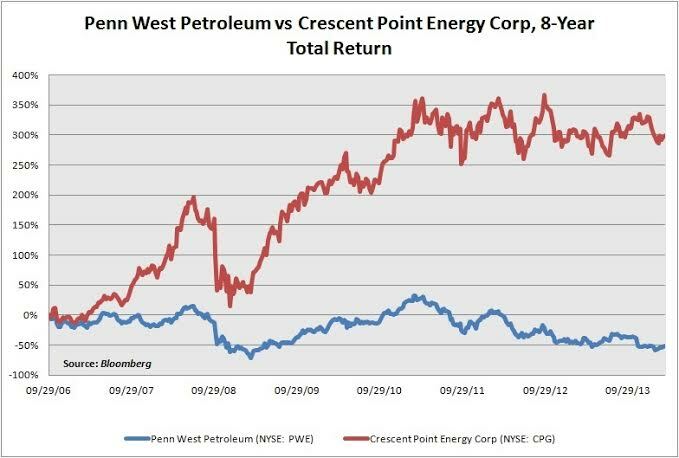 MLP producers and their investors would do well to heed the Crescent/Penn West contrast. Crescent converted to a corporation in mid-2009 without cutting its payout. The stock’s popularity soared and shortly recovered all ground lost from the 2008 crash. As a result, management was able to use equity to fund accretive acquisitions. Crescent’s production has grown from less than 40,000 BOE/day in 2008 to nearly 130,000 in 2013. Meanwhile, Penn West has cut its dividend by more than 86 percent since the trust tax was announced in 2006, with the stated purpose of using saved cash to finance growth. Its output was nearly 130,000 BOE per day in 2006. Management’s projection for 2014, however, is just 101,000 to 106,000 BOE/day, and given the company’s recent track record that could prove to be optimistic. Crescent paid out more in dividends and more than tripled in size. Penn West cut dividends to save cash to invest in growth, and has been trying unsuccessfully to dig itself out of a hold ever since. How can you tell if your energy MLPs are more like Pembina and Crescent, rather than another Penn West? First, leave behind the idea that you can do just fine by just owning an MLP exchange traded fund. The Alerian MLP ETF (NYSE: AMLP) is a capitalization weighted ETF. You’re paying to own the good, bad and ugly of the biggest MLPs. A cap weighted index of Canadian income trusts before the Halloween Massacre would have been very heavy on Penn West, with almost no Crescent or Pembina. Second, forget the conventional wisdom that a high distribution coverage ratio (low payout ratio) is a failsafe. Yes, it’s important for companies’ profits to cover what they pay out over the long haul. But when Boardwalk Pipeline Partners (NYSE: BWP) slashed its distribution by 80 percent-plus in February it simultaneously announced a very solid 2013 dividend coverage ratio of 1.19-to-1. In contrast, Pembina’s distribution coverage ratio in 2006—even with the income trust tax exemption—was just 0.97-to-1. In fact, only recently has it been reliably over 1-to-1. The difference maker: Reliable and rising recurring revenue. Pembina’s dividend was not only safe because of it, but on a clear path to go higher. Boardwalk’s revenue in contrast faced a cliff from expiring transportation contracts on its long haul natural gas pipelines. Its solid coverage ratios in 2013 and for previous years masked this risk, even as Pembina’s low coverage ratio hid its underlying strength. Pembina’s recurring revenue, disciplined use of leverage and business tax advantages enabled that company to absorb CD143 million in tax expense in 2013. That was up from CD75 million in 2012. And it still lifted dividends, while financing growth. A high distribution coverage ratio and consistent record of distribution increases are always preferable. But they’re only virtues when combined with growing recurring income and strong finances. On their own, they guarantee nothing, even if MLPs’ tax advantages last to perpetuity. Finding the MLPs most like Pembina is what we spend our time doing at Energy & Income Advisor, where we track every US energy MLP. Energy Transfer Partners (NYSE: ETP) and its general partner Energy Transfer Equity (NYSE: ETE) consistently score highly. Partners returned to a policy of regular distribution increases starting in November. Equity is reaping the benefit from its incentive distribution rights, as well as from its general partner interest in Regency Energy Partners (NYSE: RGP). The Energy Transfer empire has stakes in currently slumping natural gas infrastructure assets. But it has much more in the hotter areas of North American midstream energy, particularly on the liquids side. As a result, it has a highly transparent path to rising recurring income, which is ultimately the key to weathering any and all challenges in the midstream energy sector, including the ever-present risk of an unfavorable tax change. Energy Transfer Partners, Energy Transfer Equity and Regency Energy Partners were among the most profitable MLPs to own last year because of their return to regular distribution growth. Look for a lot more where that came from, even if Uncle Sam tries to get a larger piece of the action. Not a subscriber? Sign up for Energy & Income Advisor today to make sure that you don’t miss out.